Welcome to the Companion Website for Experiencing Jazz, Second Edition. Through readings, illustrations, timelines, listening guides, and a streaming audio library, it immerses the reader in a journey through the history of jazz, while placing the music within a larger cultural and historical context. Designed to introduce the novice to jazz, Experiencing Jazz describes the elements of music, and the characteristics and roles of different instruments. 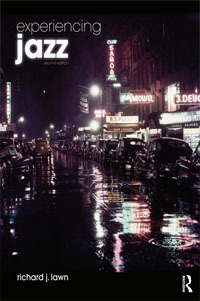 Prominent artists and styles from the roots of jazz to present day are relayed in a story-telling prose. This new edition features expanded coverage of women in jazz, the rise of jazz as a world music, the influence of Afro-Cuban and Latin jazz, and streaming audio. The media-rich companion website presents a comprehensive streaming audio library of key jazz recordings by leading artists integrated with interactive listening guides. Illustrated musical concepts with web-based tutorials and audio interviews of prominent musicians acquaint new listeners to the sounds, styles, and figures of jazz.